General Motors and Ford are both planning to lower prices and cut more production in the US as they continue to lose sales to their Asian rivals. GM saw US sales in May fall by 5.5% on the same month a year earlier, while Ford's dropped by 3%. By contrast, Nissan saw its US sales rise by 15.5% in May, while Toyota gained 7.8% and Hyundai/Kia almost 9%. 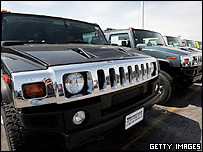 The US firms' focus on sports utility vehicles (SUVs) has caused them trouble in the face of sky-high fuel prices. Analysts have said that in contrast to GM and Ford's SUV-heavy line-up, their Asian rivals have a wider range of fuel-efficient saloon cars too. May's fall in sales was the 12th straight decline for Ford and the fourth in a row for GM. GM made a loss of $1.1bn in the first quarter of this year, while Ford saw its profits fall by 40% to $1.2bn during the same period. The two car giants are cutting production for the second quarter in a row. Ford's third-quarter reduction will be 2% following a 5% cut in the previous three months. GM's new cutback will be 9%, hard on the heels of a previous 10% reduction. Each is also to introduce a new range of price cuts for June, with GM promising to offer buyers the same discounts it offers employees, in addition to other incentives such as cash-backs. Motor analysts said the price reductions would inevitably give sales a short term boost. "It's one of those marketing things that's quick and easy to explain and quick and easy to understand," said Art Spinella, head of CNW Marketing Research. "It really would have an impact, much like 0% [financing offers] did." Yet other commentators cautioned that it was a short-term move which would most likely have a negative knock-on effect on sales in July and August - unless the price reductions were continued after the end of June. 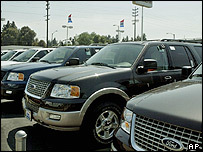 Overall annual US car sales totalled 16.7 million in May, down from 17.7 million in May of last year. But although the figures made grim reading for GM and Ford, Chrysler - the third of the Detroit "big three" - bucked the downward trend. Today a subsidiary of US-German group DaimlerChrysler, the firm saw May sales rise by 6%. And while Toyota, and in particular, Nissan saw sales increase, fellow Japanese firm Honda saw sales drop by 8%. Asian brands now make up 36.4% of the US car market, compared with 57.5% among the Detroit "big three".